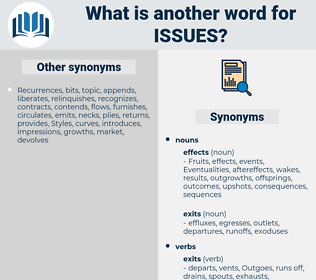 What is another word for issues? supplies, problem, problems, topic, topics. situations, fields, propositions, settings, consequences, allegations, objectives, peoples, impediments, leaders, arrangements, barriers, contents, positions, rules, spheres, tasks, assets, troubles, aspectos, obstacles, developments, Disabilities, L, pains, Canadians, Activities, complaints, targets, chiefs, domains, facts, notes, Rights, Persons, states, Goals, insights, circumstances, dots, nations, heads, questions, 'affaires, PTS, men, services, relations, 2002, determinants, sites, constraints, ingredients, Resources, enquiries, drivers, implications, Realities, temas, asuntos, Opportunities, people, Les, matters, french, FAQS, Its. troubleshooting, circumstances, questionnaire, question, questions, 'affaires, details, services, relations, difficult, service, resolution, Pertaining, briefs, sustainable, summit, perspective, perspectives, decolonization, education, international, ediciones, determinants, effects, recommendation, Recommendations, headquarters, availability, sites, consolidated, provides, solving, e., heading, constraints, ingredients, special, Isa, S, nos., milestone, evaluation, technology, rapporteur, adviser, governing, see, edits, science, organizational, des, examine, administrative, associated, chairperson, Criteria, allocation, management, position, republic, dealing, discuss, commissioner, Resources, english, parliament, calling, synthesis, connected, enquiries, Industries, division, divisions, transfers, With, locations, strategy, executive, tied, key, drivers, synthetic, linked, particulars, implications, cambodia, awareness, fighting, common, over, coordinator, news, society, america, Realities, temas, proposals, aboriginal, hardship, PROSPECTS, parts, asuntos, spots, university, Opportunities, These, Reached, adoption, canadian, relative, spanish, Their, activity, economic, lisbon, financial, XINHUA, project, OSCE, Anything, june, From, audit, ventures, ip, department, all, score, office, annex, Them, promotion, future, people, content, welfare, approach, regional, hiv, plan, paper, officer, united, trends, outlook, december, workplace, conference, haiti, expert, state, liaison, Children, great, history, h., Our, Les, matter, matters, WIPO, XXXXXX, UNCTAD, national, for, human, french, iii, cleaver, ., a., legal, to, poor, Danny, FAQ, FAQS, ground, public, :, women, bound, joint, are, Its, safe. communications, Stations, authorities, purposes, years, questioning, characteristics, statistics, shortcomings, subtopics, Questionnaires, enquires, times, subparagraphs, disputes, subject-matters, preoccupations, situations, vulnerabilities, disseminates, sub-topics, requirements, sensitivities, cuestiones, investigations, disagreements, emits, Interrogatories, transactions, decliners, Securities, liabilities, proceedings, attributes, mechanisms, sessions, determinations, responsibilities, Crises, fields, discussions, deliberations, means, Publications, dialogues, complications, inefficiencies, sujets, contentions, establishes, users, instruments, provisions, Measures, representations, reservations, propositions, solutions, hurdles, offers, institutions, clarifications, differences, conservation, Suggestions, ways, shipments, remains, Guidelines, representatives, Uncertainties, Deficiencies, decisions, principles, Regulations, substantive, steps, Deliveries, predicaments, directives, discrepancies, settings, agreements, observations, dilemmas, interpretations, conclusions, Contradictions, versions, Newsletters, Generations, talks, checkpoints, sources, Phenomena, sides, Negotiations, consequences, results, problem-solving, allegations, objectives, Consultations, occasions, Organizations, disadvantages, presents, relationships, clusters, deliverables, objections, bottlenecks, peoples, impediments, alternatives, presentations, preparation, preparations, bulletin, bulletins, systems, presidency, rises, consensus, substances, prepares, supports, briefings, Tests, respects, cards, dynamics, statements, interests, stakeholders, sizes, leaders, tensions, Incidences, deeds, improvements, recommends, ethics, newspapers, commitments, procedures, arrangements, benefits, supplements, basics, incidents, barriers, problemas, articles, disorders, reserves, priorities, METRS, shortages, Attitudes, findings, agendas, contents, Entities, Achievements, judgements, ramifications, failures, malfunctions, values, positions, recitals, processes, clauses, imperatives, Investments, infringements, submissions, Headaches, conflicts, Fisheries, rules, contributions, expectations, disciplines, shortfalls, media, directions, spheres, functions, modalities, tasks, outposts, arguments, rulings, conventions, assets, reflections, hours, Forests, governance, experiences, setbacks, Interviews, troubles, seniors, instances, Duties, deficits, nutrition, Complexities, Respondents, Researchers, Irritants, departures, Students, obstacles, headings, stocks, personnel, ministers, portfolios, developments, drawbacks, limitations, banks, views, declines, obligations, competences, moments, regions, politics, internet, interactions, offenses, aims, probes, weaknesses, Diseases, figures, Disabilities, reports, renders, Ideas, indications, practices, FACETS, skills, committees, L, mistakes, concepts, Gentlemen, rates, requests, strategies, bullets, periods, ailments, merits, participants, speakers, pitfalls, informants, Anomalies, offenders, organs, pains, outflows, consumers, Efforts, hardships, lessons, pressures, stamps, Specialists, citizens, objects, materials, doubts, approved, Analyses, arriving, Phases, options, individuals, grievances, links, needs, Animals, streams, Activities, complaints, actions, threats, scores, exchanges, held, Capabilities, Possibilities, stages, Associations, notions, passages, Categories, Risks, stores, targets, abuses, FAS, Lives, parameters, ec, indicators, chapters, viewpoints, fight, remarks, acts, Budgets, ends, commissions, motives, events, stitches, choices, Standards, electors, domains, networks, visits, shows, Companies, demands, bills, ties, Communities, groups, titles, funds, units, responses, agency, Agencies, defects, Patients, amendments, axles, outlets, backgrounds, bugs, councils, projects, Workshops, facts, dockets, Missions, notes, Crimes, workers, methods, progenies, debates, highs, volumes, volunteers, Capacities, comments, others, players, audits, references, boards, victims, Treaties, strands, routes, Prices, Conferences, Clients, games, sets, Minorities, words, protocol, examples, Prisons, original, Territories, partners, thoughts, elders, civilians, opinions, data, Rights, departments, Persons, shares, laws, Firms, approaches, sexes, hazards, changes, kits, runs, members, flaws, ills, centres, framework, inputs, levels, officers, welcomes, doorways, contexts, managers, models, ;, plans, Charges, states, knots, charts, Goals, songs, dangers, costs, works, Classes, Schools, hubs, charter, WOES, limits, Grants, experts, birds, offences, Tracks, pretexts, Axes, tables, Replies, v., who, maters, borders, fronts, deals, circumstances, november, Bets, orders, roma, Ones, Forums, 53, contacts, NGOS, bonds, Gains, answers, pays, dots, powers, odds, commands, trials, texts, markets, nations, Plants, Countries, Copies, Angles, types, Foods, gaps, awards, doors, ballots, Drugs, Plays, places, actors, _, attempts, counts, CAMPS, Worries, heads, kinds, -rrb-, Parties, D, meeting, meetings, 35, Fears, Bodies, Motions, ii, takes, cons, B, lands, Which, Bases, questions, IMPACTS, Forms, 'affaires, PTS, men, act, details, services, 2003, account, accounts, 1997, relations, LOWS, date, briefs, 2006, 2002, perspectives, determinants, effects, Recommendations, 2005, sites, provides, goods, constraints, ingredients, special, see, edits, Criteria, Resources, parliament, enquiries, Industries, transfers, locations, drivers, particulars, implications, 2001, Realities, temas, proposals, PROSPECTS, parts, spots, Opportunities, ventures, errors, annex, promotion, people, regional, trends, Children, matters, ., to, FAQS, :, women, subjects. questioning, Addressing, confronting, asking, talking, questions, dealing. distributes, ssues, delivers, suggests, signature, lies, sends, Gives, executes, determines, transmits, expresses, assigns, approves, spends, disputes, disseminates, proclaims, edit, displays, generates, gazettes, emits, Those, contributes, attributes, contains, fields, dictates, prefers, develop, develops, is, establishes, conveys, produces, Comes, 's, stresses, remains, product, casts, internal, adopts, supplies, Newsletters, presents, bulletins, prepares, holds, respects, relates, attaches, calls, rules, spheres, enters, aspectos, headings, views, reports, renders, Has, form, needs, stores, domains, shows, sets, gets, Persons, runs, Grants, who, pays, dots, awards, Does, places, takes, question, questions, perspectives, provides, constraints, S, edits, des, enquiries, temas, Les, matters, for, ., to, public, problems, items. 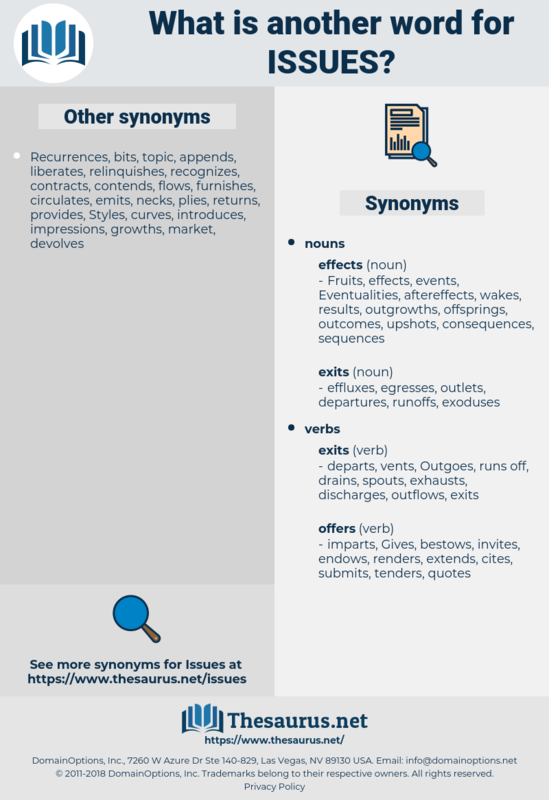 Issued, difficulty, Difficulties, election, material, list, political, safety, error, errors, gender, research, subject, subjects, item, items, edition, editions, causes. Controversies, Genders, violence, Difficulties, item, items, editions, causes. Here was one of those " grand issues" that he felt worthy of his abilities, - it was a cause where he was proud to hold a brief. I was only thinking, my friend, on what small issues fortune or poverty may rest.